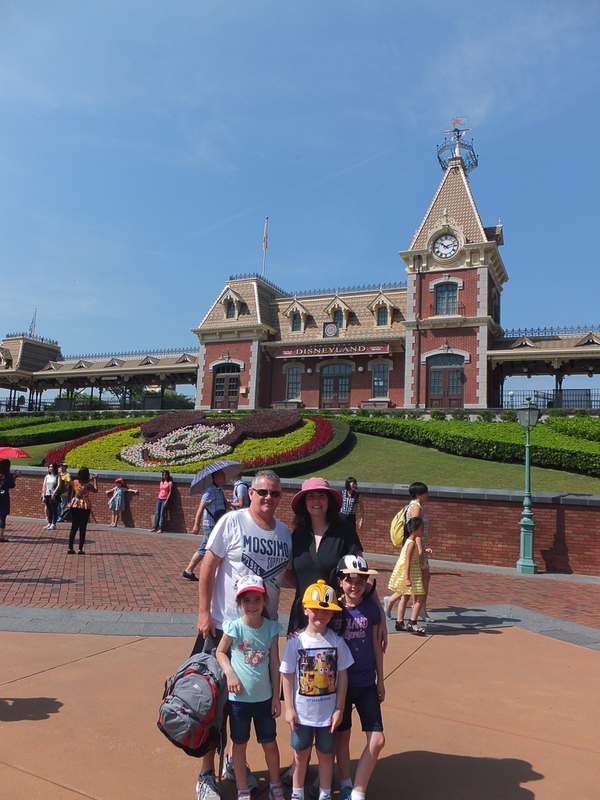 The main reason for our recent family holiday was to take the kids to Hong Kong Disneyland. 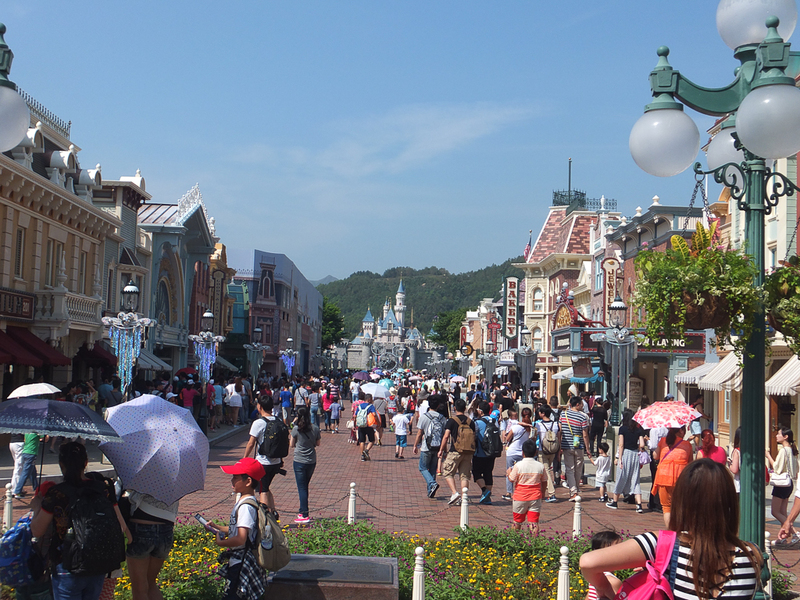 We choose Hong Kong Disneyland specifically as it is more focused for the younger age group. The fact that it was my 40th birthday was just an excuse to get us there. 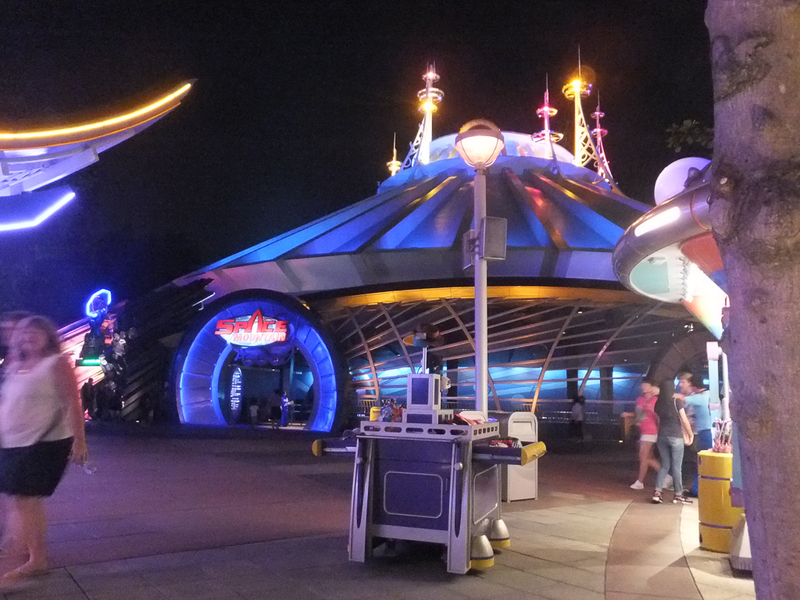 Read below for our detailed Hong Kong Disneyland review. I wish someone had told me this before our first visit to a Disneyland park, I was overwhelmed with joy watching the kids faces that I didn’t think to capture it on video or in photos. Your kids faces will be one of utter excitement, the kind that you may never see again, get your camera out and video it. I can’t tell you how beautiful it is to witness the pure elation of visiting your first Disneyland park and it is evident all over their faces, hold on to that forever as it is worth every cent it cost you to get there! We have now been to 3 Disneyland parks around the world and we didn’t experience the emotions with the kids like we did the first time. I had the camera out ready but it just wasn’t the same. You’ll know what I mean when you get there, if this is the only thing you take away from my Hong Kong Disneyland review, I’d be happy with that! Capture it as it’s purely magical to experience it with them. We have since visited DisneySea in Tokyo so if you are heading to Tokyo make sure you read our review. 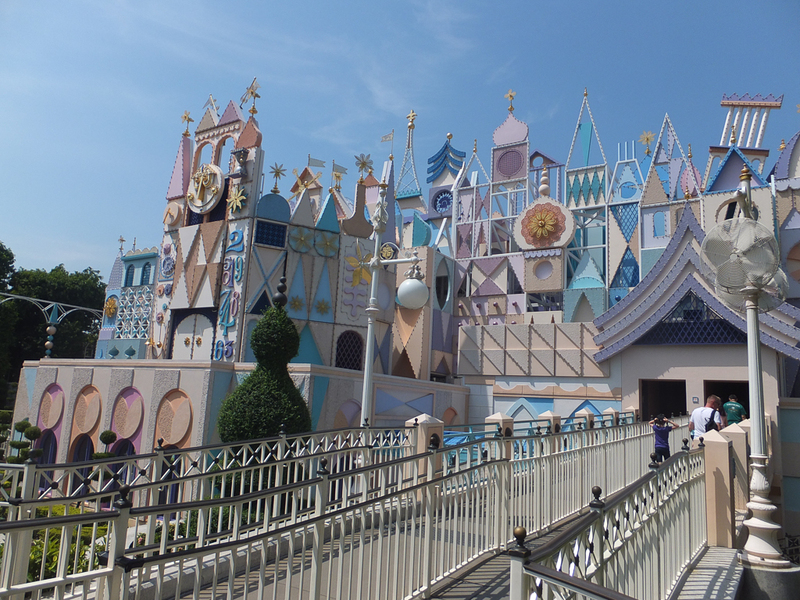 My Disneyland LA review is in the making – coming soon! The new Disney MaxPass at Disneyland California is great value and includes an express pass and unlimited digital photos, read our post for more information. Our children are currently 9 years old, 7 years old and 5 years old and are exceptionally small for their ages. Alannah is nearly 10 and wears size 6 clothes, Keira is 7 years old and wears size 4 clothes and Caelan is 5 years old and wears size 4, he is closest to being a normal size for his age. 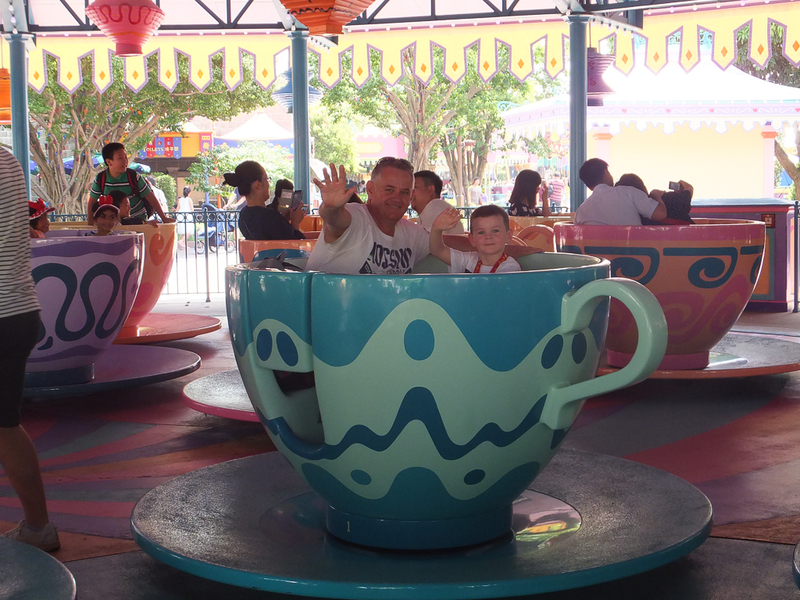 Most theme parks have height restrictions as opposed to age restrictions so their height becomes an issue. 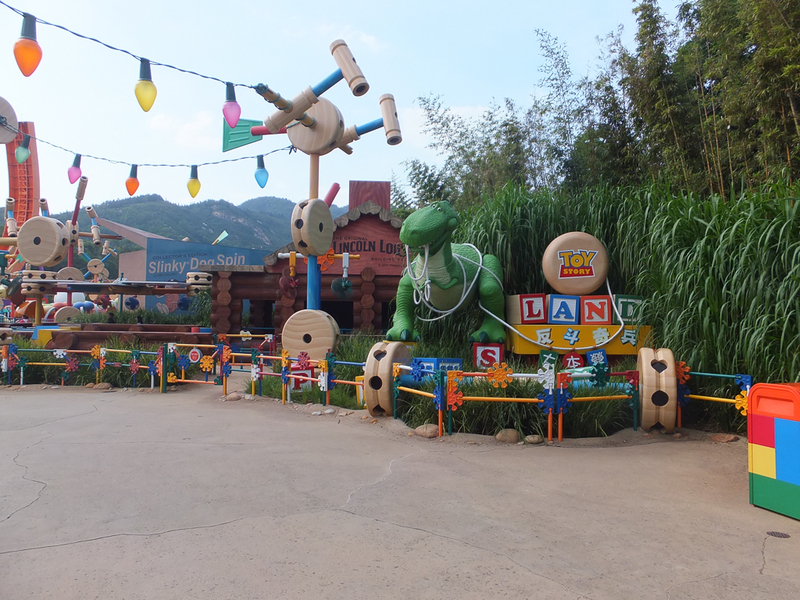 We found that as Hong Kong Disneyland is focused on this age group that the kids were able to go on every ride. It was very hot the day that we went and we were lucky that the crowds were not ridiculous. We never had to wait for a ride for more than 30 minutes. We also arrived just before opening time so that we could get in and take some reasonable photos before the crowds arrived. We were able to move around freely and whilst there was a decent crowd it was no where near what I had expected. This was a huge relief as I had wondered how the kids would manage having to wait for hours for the rides. Especially as the humidity was very high and the kids had just come from a Melbourne winter. We did the outdoor rides in the morning and during the heat of the day we did some of the rides that were undercover. It worked well and we found that the kids coped really well. We stopped regularly for water and ice cream and the kids thoroughly enjoyed every minute of it. 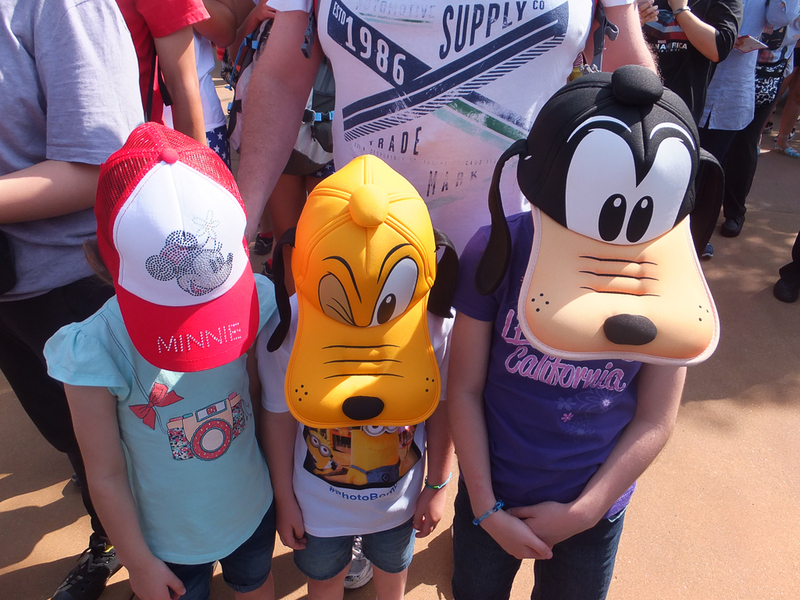 Got our new Disney hats so we are ready to go! The theme park is very accessible by public transport. 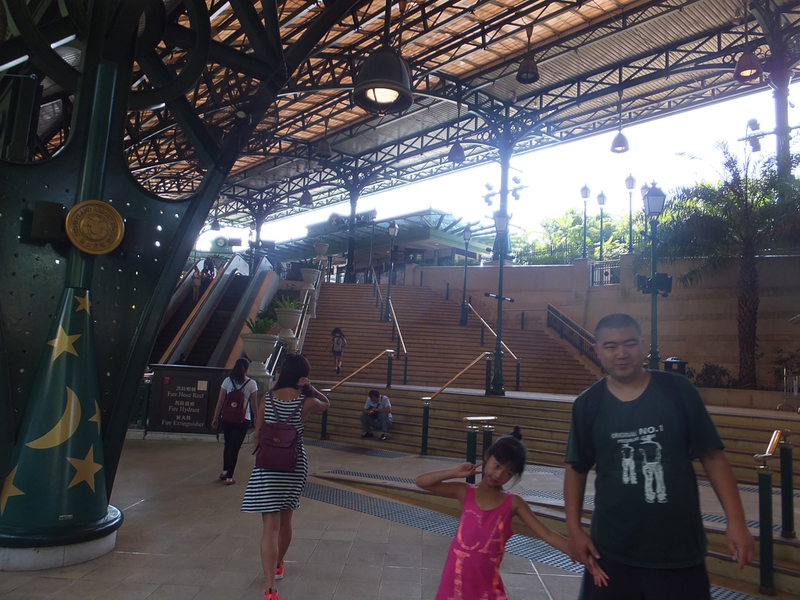 The MTR connects to the Disneyland Resort train and Sunny Bay station and takes approximately 30mins from Tsim Sha Tsui station in Kowloon. The kids were pretty excited about the themed train and gets everyone excited before you even arrive. You are also able to use your Octopus Cards right up to the gate. Kids were excited to meet Jesse! Space Mountain, we got there late but it was by far the favourite. 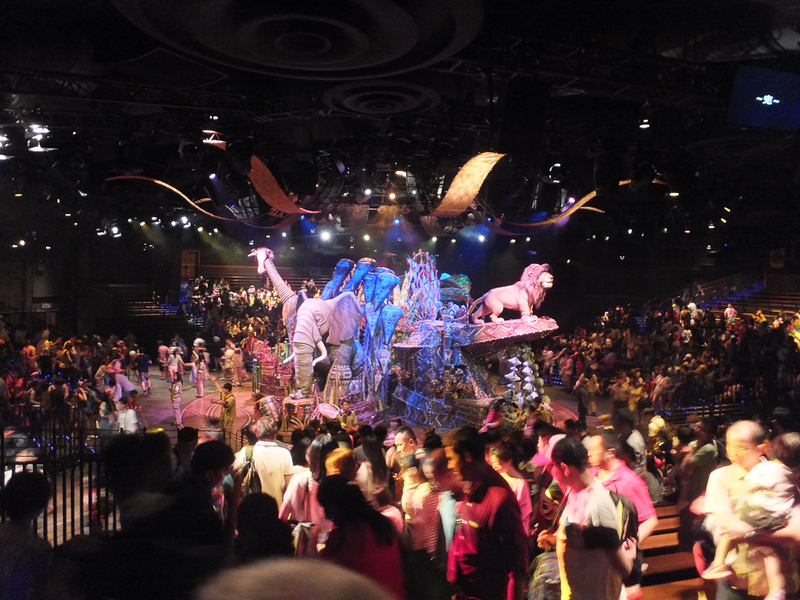 The Festival of the Lion King, great show. Main Street USA – location of the Flights of Fantasy Parade and Disney in the Stars Fireworks. There are souvenir stores everywhere but everything sold within the park is also available in Main Street, which means you don’t have to shop as you go and lug it round all day. We did our shopping in the evening and I think everyone else had the same idea so my suggestion, do your shopping on the way out unless you are staying for the parade and fireworks then do it a few hours before this. Have photos with the characters early, there is generally a queue for each character. The wait for Minnie Mouse was 40 mins & Mickey Mouse was 30 mins. Craig lined up at one and myself at the other and my sister and her husband would run between delivering the kids to the shortest lines. Mickey & Minnie on this occasion had the longest lines. We bought all the photos for $60AUD, they download them to a website and provide you with a password for access in your own time. You have 2 weeks to access them and save them wherever you like. 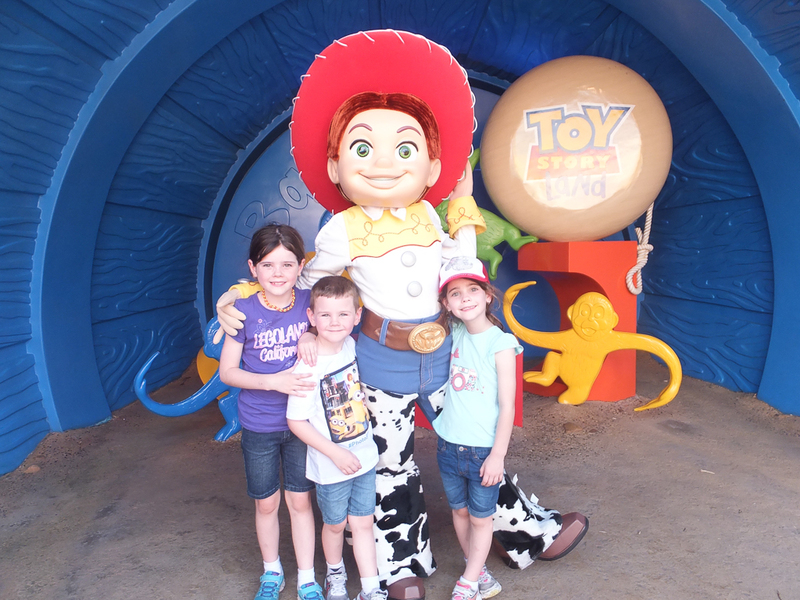 This is a pay once only arrangement and you can add photos with other characters around the park as you go. There is no further costs involved if you send them to the website. Just make sure you don’t lose the card with the details for accessing the website. I bought the kids a lanyard each for their trading pins, I found the rubber backings kept coming off and I spent way too much time looking for them so in the end I put them in my bag to keep until we got home. I bought a starter pack for each child and then purchased one of their favourite characters. I found the pins to be very expensive therefore we didn’t buy many at all. It is something we can add to though so a good souvenir to keep down the track. There is plenty of them and if your prepared to spend the money you could have good fun trading with the employees. There is food everywhere and all reasonably priced. We had breakfast on the way and then an ice cream at lunch time and as it was so hot the kids weren’t overly interested in eating. I don’t allow them to drink fizzy drinks so we keep the water up all day and they had a couple of fruit salads over the afternoon. There is a good selection of restaurants located at each area and there is also plenty of food carts selling everything from squid to corn cob sticks and hot dogs located around the place. After the ‘Festival of the Lion King’ Show we had a hot dog each and the ladies had a corn cob stick with melted butter. Staying for the parade and fireworks is a must. Now as I said earlier there didn’t seem to be all that many people at the park on the day we went but when we arrived for the parade it was like people had just appeared for the show. It was packed and a large majority of people were pretty pushy in relation to getting their own child up front and centre. We stood at the back and put the kids on a brick wall behind us and they were able to hold on to our shoulders. This gave them a good view of the parade. As adults didn’t see as well but we made do. The firework display over Sleeping Beauty’s Castle is just breathtaking if you get there in time, Craig got stuck in the shop paying for the souvenirs and missed the start. 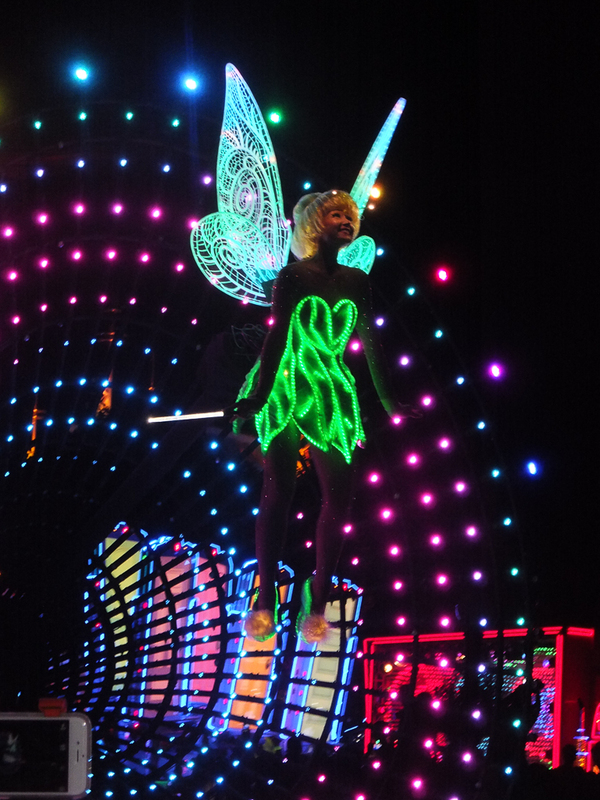 Tinkerbell during the Disney evening parade. After the parade there is a big rush to the MTR with thousands of people wanting to get home quickly. We decided to go to one of the Main Street eateries and have a drink and a quick snack on hot chips. This gave the crowd time to thin out which it did quickly and we also got some lovely photos of Disneyland all lit up like a Christmas tree! We got some great shots as there were very few people around. 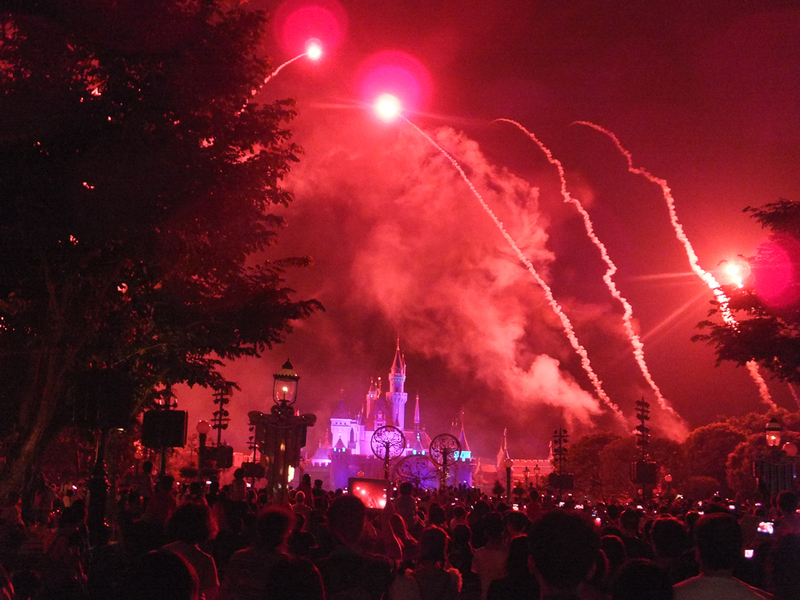 Hope you have enjoyed my Hong Kong Disneyland review as much as I have reliving the experience while writing this. Getting into the park cost us $260AUD which sounds steep but its a once in a life time experience. We pay just as much to go to the Queensland Theme Parks and they’re not Disneyland. Apart from the souvenirs I found all other things really reasonably priced. I wasn’t sure how the kids were going to go with the heat but they managed to stay from open until close, 13 hours!! 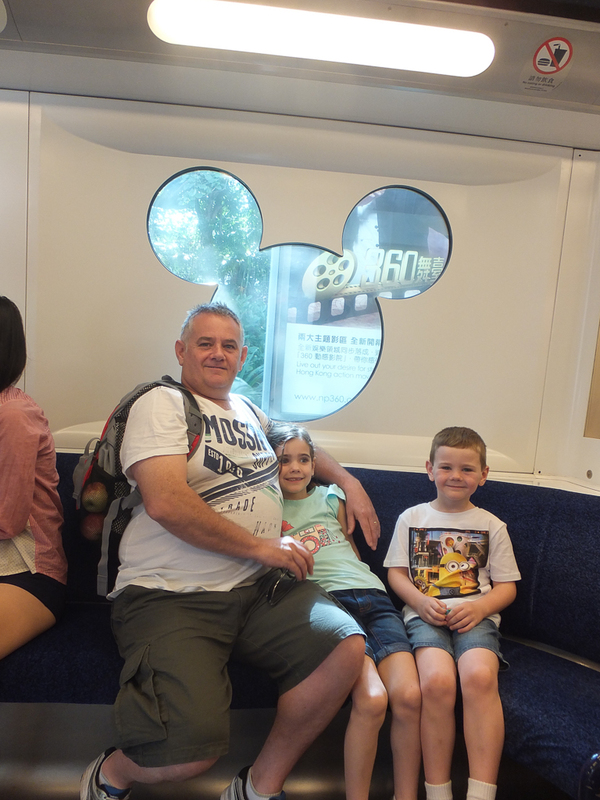 We had an awesome time at Hong Kong Disneyland and I feel we managed to soak up every ounce of the experience. The kids were great and had a ball and it was priceless watching their faces as they took it all in. Was it money well spent? You bet ya it was!! I would do it again tomorrow. We even got a sleep in until 8am the next morning! On the way in I got a bit overwhelmed by it all, I grabbed my sisters arm and said ‘I think I’m going to cry, I’m so happy to have been able to bring the kids to Disneyland’! 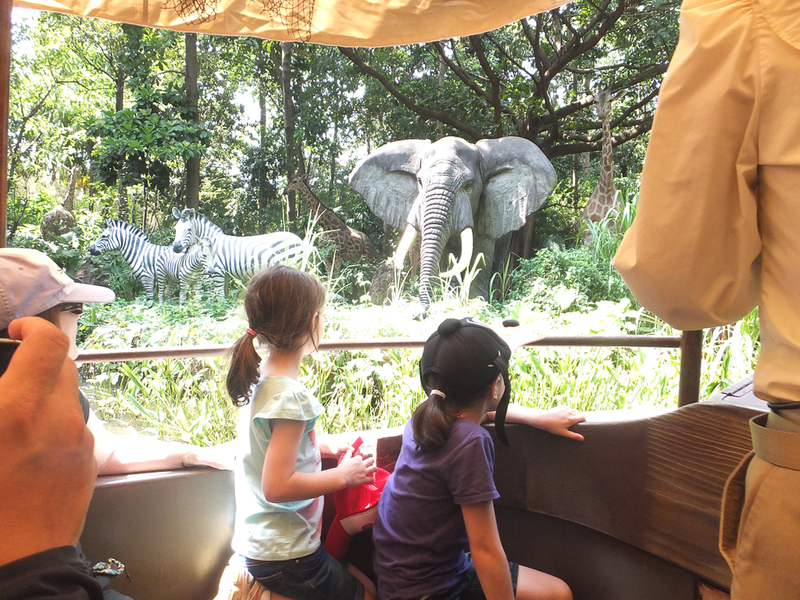 People often find it difficult to decide whether to visit Hong Kong Disneyland or Ocean Park when visiting Hong Kong, I say it really depends on the age of your children. If your kids are in prams, Ocean Park might not be the best option. While in Hong Kong we stayed in an Airbnb in Granville St, Kowloon and while it was very small it served its purpose and was a very economical option for us at the time. Please feel free to ask me any questions or subscribe to my blog, I look forward to hearing from you. Until next time Disneyland, farewell. ← 2 weeks until departure – the ‘to do’ list! I almost teared up when you said that you got overwhelmed taking your kids! I think I would be like that also!! Hi Kristie, now you nearly made me cry, that’s all I have ever wanted is to inspire others to get out there. Travelling as a family is the best, I love seeing them explore & see new things. I love it when they talk about things they remember from trips we have taken. I make photobooks of every trip as well so that they can sit down & flick through them together or by themselves. I happy to answer any questions you might have about places or where to stay, in fact planning is my favourite bit. I’m glad you enjoyed that post I think it’s my favourite post! Thanks Sal.